Wow! Our baby is grown-up! Just two years old, short of one month. There’s always excitement and pride when a young plant blooms for the first time ever upon maturity. This time, it is an orange Crucifix Orchid that was added to our garden in May 2007. Voted as our star orchid for May 2009, this lovely beauty has been blooming its head off since the beginning of April and continues till this very day with two more buds to unfurl. How marvelous too that I managed to discover its name by googling a few days ago. It is a cultivar of Epidendrum fulgens, one of the numerous species of the genus Epidendrum and commonly known as Reed Stem Epidendrum or Crucifix Orchid due to the formation of its lip that is joined to the column and has three lobes, bearing some semblance of a cross. 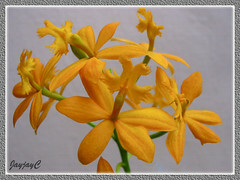 (Edited June 17 2009: Correction on ID – its botanical name is Epidendrum x obrienianum, a hybrid of E. ibaguense! Confirmation was obtained via email to [email protected]. A big thank you to Dr. Neil Lancaster, RHS Botanist, Wisley who kindly helped in its identification). 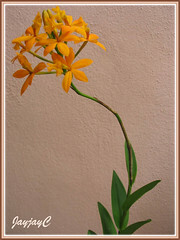 Do browse here for some plant information and pictures on the Epidendrum species and hybrids. 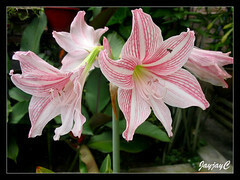 Another beauty, worthy of mention is the salmon-colored Hippeastrum (Amaryllis) that has not failed to bloom during Easter. This time though, it bloomed 3 weeks after Easter Sunday, but nevertheless still within the Easter Season. 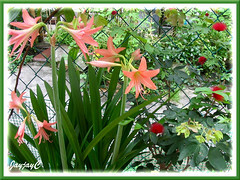 Seen in the left photo below is the ever faithful Hippeastrum and the year-round red bloomer, the Dwarf Powderpuff (Calliandra emarginata), both of which are container-grown and located at our backyard. Sharing on the right, is a picture of another Hippeastrum ‘Mrs Garfield’ that bloomed just in time for Easter Sunday, pre-empting its relative, the salmon-colored one! hello there jacq and john! it was my first time to visit this site (was looking for mussaenda sp. in google….). a magnificent site you have here! I enjoyed seeing all your posts, up to 2006! i would like to ask for your help if you could help me identify some plants that i have in my garden, if it wouldn’t be much of a bother. Just from one (beginner…) gardener to another. I’ll appreciate the help. Thank you. Will visit your site soonest.